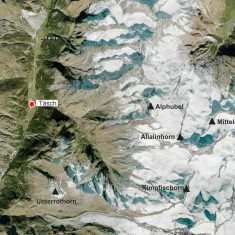 Saas Fee – Täsch – Zermatt | Saas Fee – Täsch – Zermatt | Ecosign Mountain Resort Planners Ltd.
A ski route has existed for many decades between the Rothorn ski area in Zermatt and the Saas-Fee ski area of Switzerland. A lift connection between these two, world-famous high alpine ski resorts has been considered for many, many years. More than thirty years ago, Mr. Hubert Bumann of Luftseilbahnen Saas-Fee AG considered a three section lift system from Saas-Fee up to the Feechopf summit at elevation 3,888 to become the highest lift-serviced alpine skiing in Europe. 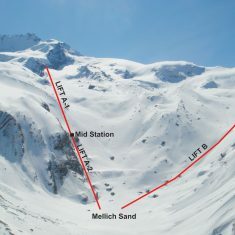 The current lift-serviced system in the Rothorn Paradise area at the top of the Unterrothorn lies just seven kilometers distance from the top of Mittelallalin 2 and 3 glacier lifts in Saas-Fee as the crow flies. In the early summer of 2000 Ecosign Mountain Resort Planners Ltd. was commissioned by Luftseilbahnen Saas-Fee AG and Zermatter Rothornbahn AG to complete a technical assessment of the Täsch Valley which lies between the Rothorn and Saas-Fee ski areas and provides the terrain which is the logical link between the two ski areas. All of this terrain lies within the territory of the Community of Täsch. 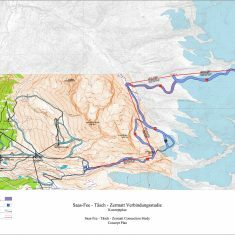 Ecosign has proposed a connection between the two ski areas which includes a total of four detachable six passenger chairlifts and pistes associated with these lifts. 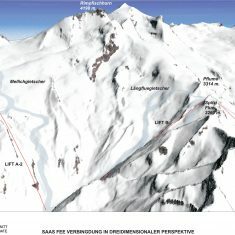 The connection travels from Fluealp in the Rothorn ski area up to Spitzi Flue and through the Täsch valley up to the ridge below Allalinhorn at the Saas-Fee ski area. By developing pistes beside these lifts, skiers can ski downhill rather than downloading on these lifts, making the connection between the ski areas a much more enjoyable experience. The pistes will also allow the lifts to be used as return cycle skiing as well as transportation. The lifts proposed, however, are directly connected station to station to allow transport of foot passengers in both directions.